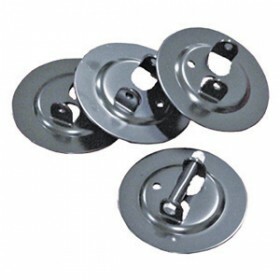 Set of four 6 inch diameter pads for the Light Trailer Stabilizing Jacks. Provides firm footing on loose ground. Easy to install with provide hardware. Rubber sleeve prevents rattle during travel. "I found the website very easy to navigate. They filled my order promptly and I received my order..."
"Quick service - great product!" "Excellent customer service. I was kept informed about my order and shipping information was right..."